This top-floor, one-bedroom/one-bath condo features a great view overlooking a park and the beach. Sheets are provided, bath towels, wash clothes, dish towels and toiletries are not. New electronic lock means no more keys to wait for, or send back or loose. Great place for snow birds to spend the winter! Resort has just completed $3,000,000 in renovations. Enjoy all the features of a large resort including pools, a lazy river, jacuzzis and a game room, without long waits for an elevator back to your room. 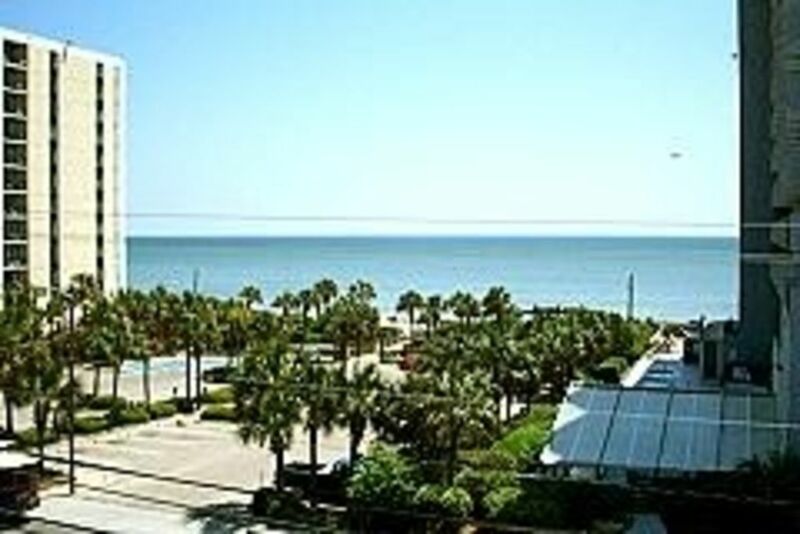 Great view of the beach for an extremely affordable price . The property is well taken care of and you saw security walking around often. Very quite and relaxing stay. Quick drive to all the attractions. Condo unit was clean and owner was very responsive. I would definitely recommend to others. We enjoyed our stay at Ron's condo at Blue water resort. Everything was in place. We didn't have to want for nothing. It was close to the beach and to Broadway at the beach. The only problem was the bedroom door was hard to open but other than that it was great. Would definitely stay here again. Old room but good location. Most of the stuff with the room was good except that it was old and little bit dusty sofa and chairs. Bathroom was in good and clean condition. You need to get parking garage badge to park in there in case you don't find parking around the building. Everything was very old and sticky. I stayed from August 5-12 and when I got there it was very stinky and old. I took me about an hour to clean up so that the tables and furniture were not sticky. My family and I just rented this condo for a week and we enjoyed staying here. The place is in the middle of everything in Myrtle Beach. I like the short walking distance to the beach. My kids loved the pool and the lazy river. The furniture and kitchen appliances are in decent condition. It could be replace with new, but its still in decent condition. The floor tiles throughout is the right way, especially after the pool or the beach. Overall, we will come back to rent this place again.